Thyme is any of several species of culinary and medicinal herbs of the genus Thymus, most commonly Thymus vulgaris. The dried leaves and flowering tops of the shrub Thymus vulgaris L. There are two important variations: French thyme, which has a narrow leaf; and lemon thyme, which has a variegated leaf. It is used in soups, cheese, sauces, and appetizers. Fresh thyme is commonly sold in bunches of sprigs. A sprig is a single stem snipped from the plant. 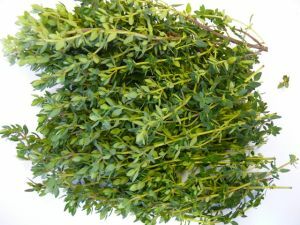 Dried thyme is widely used in Armenia in teas. Thyme leaves offer significant levels of quality phyto-nutrients profile. Just 100 g of fresh leaves provides (% of Recommended daily allowance) 38% of dietary fiber, 27% of vitamin B-6 (pyridoxine), 266% of vitamin C, 158% of vitamin A, 218% of iron, 40% of calcium, 40% of magnesium and 75% of manganese but no cholesterol. Thyme herb contains thymol, one of the important essential oils, which scientifically has been found to have antiseptic, anti-fungal characteristics. The other volatile oils in thyme include carvacolo, borneol and geraniol. Thyme contains many flavonoid phenolic antioxidants like zea-xanthin, lutein, pigenin, naringenin, luteolin, and thymonin. Fresh thyme herb has one of the highest antioxidant levels among herbs, a total ORAC (Oxygen Radical Absorbance Capacity) value of 27426-µmol TE/100 g.
The herb is also a rich source of many important vitamins such as B-complex vitamins, beta carotene, vitamin A, vitamin K, vitamin E, vitamin C and folic acid. Thyme provides 0.35 mg of vitamin B-6 or pyridoxine; furnishing about 27% of daily recommended intake. Pyridoxine keeps up GABA (beneficial neurotransmitter in the brain) levels in the brain, which has stress buster function. Vitamin C helps the human body develop resistance against infectious agents and scavenge harmful, pro-inflammatory free radicals. Vitamin A is a fat-soluble vitamin and antioxidant that is required maintaining healthy mucus membranes and skin and is also essential for vision. Consumption of natural foods rich in flavonoids like vitamin A and beta-carotene helps protect from lung and oral cavity cancers.